The North Shore Dragon Busters have just ended their inaugural year and what a year it was. The Dragon Busters are the only dragon boating team of its kind on the North Shore, comprised solely of breast cancer survivors. We had our challenges this first year such as getting the word out about our amazing team, finding sponsors, fundraising and getting ourselves more fit and ready to compete in regattas. 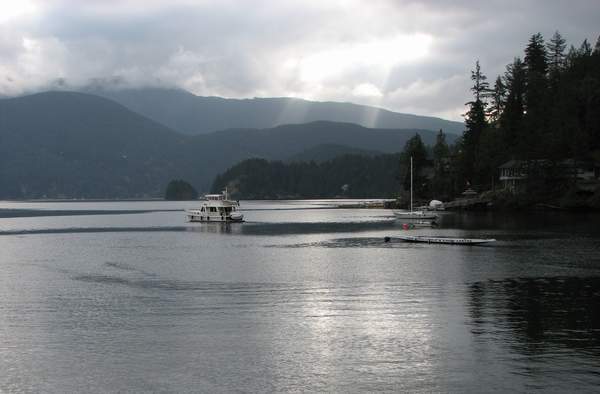 You may have seen and heard us practising on the waters of Deep Cove every Wednesday evening and Saturday morning from March to September. Our dockside warm-ups alone drew lots of spectators. Members of the North Shore Dragon Busters, a breast cancer survivor dragon boating team based in North Vancouver, paddle at Harrison last summer. The team is currently recruiting for their next season, which gets underway in March. One of our major goals this year was to increase our visibility on the North Shore and offer more service to our own community. We participated in several community events such as the Canadian Cancer Society’s Relay For Life where we donated monies and won the coveted Spirit Award. 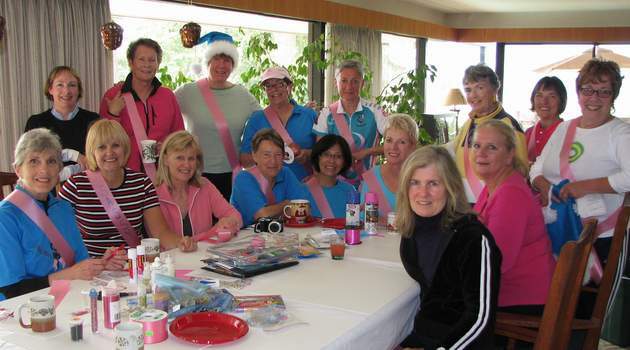 We also helped to raise funds for the Breast Cancer Foundation and increase awareness of breast cancer prevention. This was accomplished by supporting all the local Safeway stores during their Think Pink Days. The Telus Tour for the Cure campaigns held at Park Royal Shopping Centre and Capilano Mall were also given a boost by the presence of our team colors. Volunteering, participating in, and supporting local dragon boat regattas as well as other sporting events in the community was also part of our mandate. The icing on the Christmas cake, however, was winning first prize for our decorated tree at the Dundarave Festival of Lights. This worthwhile event raised more than $22,000 for the North Shore Shelter. 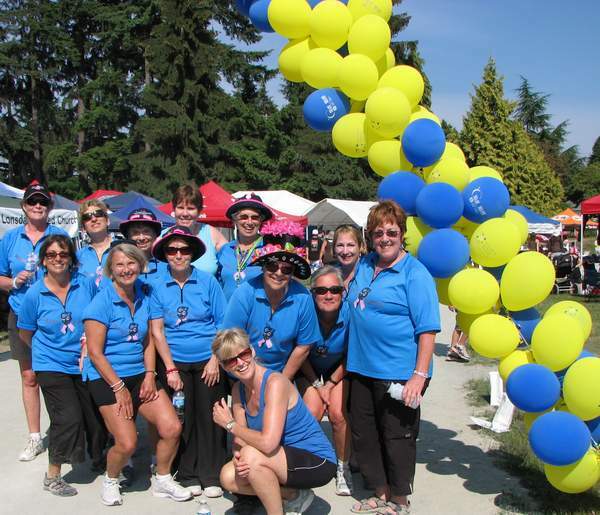 Other highlights this past year for our team members include competing in dragon boat racing and walking away with our first gold medal in the women’s division at the Fraser Valley Regatta in Harrison. 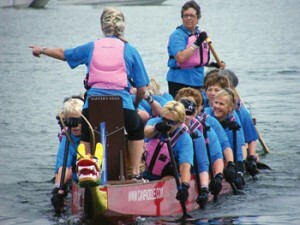 Some of us also travelled to Halifax, N.S., for a national breast cancer dragon boat event. The power of this team lies in its group cohesiveness and support. Individual members are encouraged to start where you’re at, but strive to be the best that you can be. We believe in facing life’s challenges head on. For example, we have two members who are once again battling breast cancer but what helps their difficult journey is knowing that they have a whole caring supportive team behind them. A few of our individual members have further challenged themselves by competing in world marathons for paddling, running, and walking. Participation in a team sport, such as dragon boating, helps to restore the belief that there can still be life after breast cancer. In fact it is often just the beginning of an incredible journey. The North Shore Dragon Busters are once again recruiting for new members to begin our next season — March-September. We’re calling on all those who have had or are currently coping with breast cancer to give us a call, at 604-924-2424. We’ve organized an information meeting for new members on Wednesday, Feb. 25, from 7 to 9 p.m. at North Shore Neighbourhood House, located at 225 East Second St. This could be the start of your own incredible journey. If you would like to help out in other ways by joining us as a sponsor or making a donation, please call us as well. For more information, e-mail newmembers@dragonbusters.ca or visit our website at www.dragonbusters.ca.